Low Country Laundry & Dry Cleaners understands the importance of giving back to the Charleston community. Each month it chooses a non-profit to donate a percentage of sales. Upcoming recipients include Courageous Kidz in February and Begin with Books during March. Past non-profits receiving funds include My Sister’s House, Share Our Suzy, Center for Women and Be A Mentor. Founded in 2001, Low Country Laundry & Dry Cleaners is a full service laundry and dry cleaner with same day cleaning, free pick-up and delivery as well as three convenient Charleston locations. Low Country Laundry & Dry Cleaners handles everything from draperies and comforters to leather, suede and fur as well as bridal gown pressing, cleaning, preservation and restoration. In addition to servicing 52 hotels, over 20 restaurants, and 6 hospitals, Low Country Laundry & Dry Cleaners also offers 24/7 LaundryMatic locker systems, a custom delivery based locker system that extends 24/7 service to thousands of customers living in condos or apartments in Charleston. Low Country Laundry & Dry Cleaners strives to provide the best customer service and overall quality available. For additional information about Low Country Laundry & Dry Cleaners, visit www.lowcountrydrycleaners.com. Share Our Suzy Presents the 11th Annual Memorial Day Weekend Party with Indecision, Five Way Friday and The Archetypes on Saturday, May 23rd at 5:00pm – 10:30pm at The Grove at Patriot’s Point. 100% of net proceeds for this event will directly benefit breast cancer patients in South Carolina. Tickets are just $45 through Friday and will go up to $60 on Saturday. Tickets include food, beer and wine. Share Our Suzy was founded in memory of Suzy McGrane who was diagnosed with breast cancer in her late twenties, while uninsured. SOS helps South Carolina breast cancer patients and their families by providing assistance to ease their journey from diagnosis to recovery. For information please go to www.shareoursuzy.org. Share Our Suzy Presents the 10th Annual Memorial Day Weekend Party with Indecision and Five Way Friday on Saturday, May 25th at Waterfront Park in Mount Pleasant. Tickets are $35 in advance or $50 on day of show. The food will be catered by Home Team BBQ and adult beverages are included in price of admission. Doors open at 5:30pm with Five Way Friday from 6:00pm – 7:30pm and Indecision from 8:00pm – 10:30pm. 100% of net proceeds for this event will directly benefit South Carolina breast cancer patients and their families by providing assistance to ease their journey from diagnosis to recovery. For information pertaining to this wonderful cause in memory of Suzy McGrane, please go to www.shareoursuzy.org. Share Our Suzy presents the 8th Annual Suzy McGrane Memorial Party on Saturday, May 26th at 5pm at Lighthouse on the Creek in Mt. Pleasant. In addition to classic shrimp boats, playful dolphins and lowcountry sunsets on Shem Creek, this favorite Memorial Weekend event will feature cocktails, a spread from Home Team BBQ, and live music from Five Way Friday & Gaslight Street. $35 advance tickets are available at etix.com or admission is $50 at the door. It is the sponsors that make the event possible: Roper St. Francis Cancer Care, Richardson, Patrick, Westbrook and Brickman, O’Brion’s Pub & Grille, Shoreline Productions and Eskimo Advertising. Additional sponsorship opportunities are still available for the event. Suzy McGrane was a local photographer who was diagnosed with breast cancer in her early twenties and ultimately lost her battle when the disease returned years later. What started as Save Our Suzy is now known as Share Our Suzy. The goal of SOS is to bridge the financial gap and allow breast cancer patients to focus solely on recovery and not the financial stress brought on during this very difficult battle. Funds raised cover the critical areas that insurance companies do not by providing assistance to those with daily needs such as wigs, prosthetics, childcare, gas cards, utility bill assistance, medication assistance and more. Share Our Suzy’s mission is to raise money and resources to assist and support breast cancer patients in South Carolina from diagnosis to remission. For more information about Share our Suzy, the memorial party or to purchase tickets, please visit http://www.shareoursuzy.org. 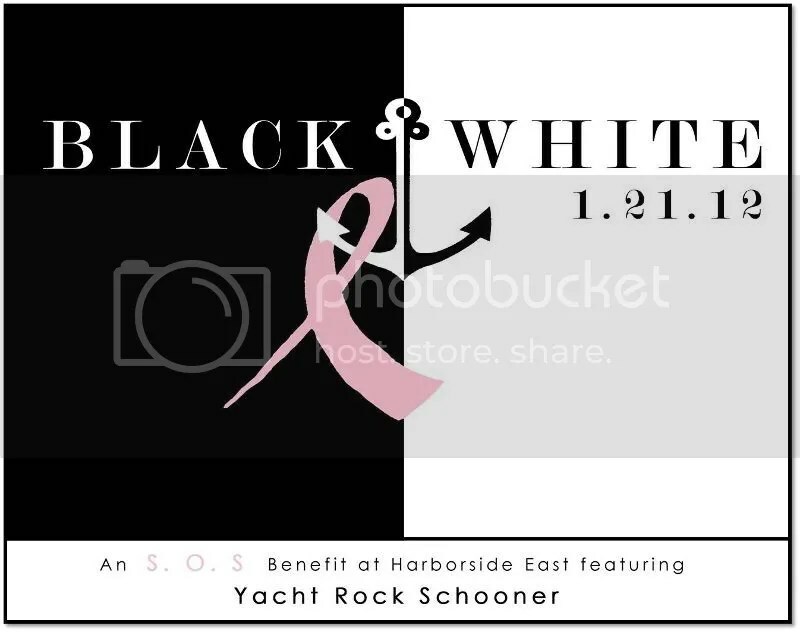 Please join SOS: Share Our Suzy for its 4th Annual It’s Black and White benefit party on Saturday, January 21st from 7-11pm at Harborside East in Mount Pleasant. Surrounded by breathtaking views of the Charleston harbor, the black tie event with a nautical spin will feature live musical entertainment by Atlanta’s renowned party band, Yacht Rock Schooner, as well as amazing food by Granville’s Catering, fun adult beverages and more! Guests will also have the opportunity to learn more about the needs of breast cancer patients, ways to assist and directly impact the lives of women battling the disease in the Charleston area. Gracious sponsors make the event possible and include Roper St. Francis, RPWB, O’Brion’s Pub, Patrick J. O’Neill Plastic Surgery, Hibbits Insurance, Moultrie News, 105.5 The Bridge, News 2, The Law Office of Mark Tanenbaum, Beachside Real Estate, Skipper Law Firm, Bella Bridesmaid, Charleston Artist Collective, Granville’s, Charleston Endodontics, Lee, Eadon, Isgett, Popwell and Reardon, P.A., O’Brion’s Pub & Grille, Force Protection, Eskimo Advertising, ProLegal Copies, and Eclectic Interior Design Group. Additional sponsorship opportunities are still available for the event. SOS helps South Carolina breast cancer patients and their families by providing assistance to ease their journey from diagnosis to recovery. Unlike other breast cancer organizations, SOS bridges the financial gap for day to day expenses that insurance does not cover. Share Our Suzy was originally started as an effort to aid local photographer Suzy McGrane who ultimately lost her battle with cancer in 2005. While in remission Suzy took over SOS to help others with cancer. The SOS Foundation continues Suzy’s mission to allow patients to focus solely on recovery and remission, not the financial stress brought on by this difficult battle. For more information about Share our Suzy, please visit www.shareoursuzy.org. Advance tickets on sale here for $75 until January 10th, then they will be $100, so get yours now! You can also make a donation at any amount. If you would like to be a sponsor, a volunteer or want more information about Share Our Suzy, please email lowcountry@shareoursuzy.org or visit our website www.shareoursuzy.org. SOS helps South Carolina breast cancer patients and their families by providing assistance to ease their journey from diagnosis to recovery. Memorial weekend sets the scene for one of Charleston’s favorite fundraisers as Share Our Suzy presents the 7th Annual Suzy McGrane Memorial Party on Saturday, May 28th from 5:30-11:30pm at Lookout Pavilion at Charleston Harbor Resort and Marina located at 20 Patriots Point Road in Mt. Pleasant. In addition to supporting a great cause, the event also features cocktails, local food, and live music from Indecision & Gaslight Street. Advance tickets are $35 (food & drinks included) and $25 (drinks included) and are available at etix. Suzy McGrane was a local photographer who was diagnosed with breast cancer and ultimately lost her battle in her early twenties. What started as Save Our Suzy is now known as Share Our Suzy. The goal of SOS is to bridge the financial gap and allow breast cancer patients to focus solely on recovery and not the financial stress brought on during this very difficult battle. Funds raised cover the critical areas that insurance companies do not by providing assistance to those with every day needs such as wigs, prosthetics, childcare, gas cards, utility bill assistance, medication assistance and more. Share Our Suzy’s mission is to raise money and resources to assist and support breast cancer patients in South Carolina from diagnosis to remission. One of the originators of the jam band movement, Indecision‘s innovative music is a unique blend of rock, jazz, blues and extended jams complete with rich and complex lyrics. Indecision has shared the stage with musicians such as Widespread Panic, Phish, Blues Traveler, Dave Matthews Band, Jorma Kaukonen, Hootie and the Blowfish, The Neville Brothers, The Connells, Jupiter Coyote and more. Not all Southern rockers fit into an expected mold and that is exactly the case for the rhythm and blues five-piece, Gaslight Street. By incorporating Southern music traditions with their own life experiences, these long time friends have shown that Southern rock still has a place in the American music pantheon. Gaslight’s hard rock edge and fast guitar leads keep their loyal core of music loving fans thirsting for more. For more information about the organization or performers, check out www.shareoursuzy.org, www.indecision.com and www.gaslightstreet.com.